Summer home repair projects often include house painting, especially for older homes after a hard winter. On Wednesday, April 3, Nicholas A. Macmillan, manager of Tiffin’s Sherwin-Williams Paint store, will provide insights on choosing the correct paint for your home or building. Macmillan’s presentation starts at 7 p.m. in the Frost Kalnow Room at Tiffin-Seneca Public Library, 77 Jefferson St. Sponsored by the Tiffin Historic Trust, the event is free and open to the public. Accompanying the guest will be a local house painter who has experience working on older historic homes and can help answer the painting questions that plague homeowners. Sherwin-Williams is known for its historic interior and exterior preservation color palettes. They have coordinated color schemes for homes in all architectural styles from Victorian and Craftsman bungalows to suburban mid-century modern homes. The palette recommendations are based on the original color schemes used within the respective architectural eras. As a bonus, the Sherwin-Williams store in Tiffin will offer a discount to those who attend the program. For more information, contact Mary at (419) 448-0370, visit www.tiffinhistorictrust.org or find the group on Facebook at www.facebook.com/tiffinhistoric.trust. 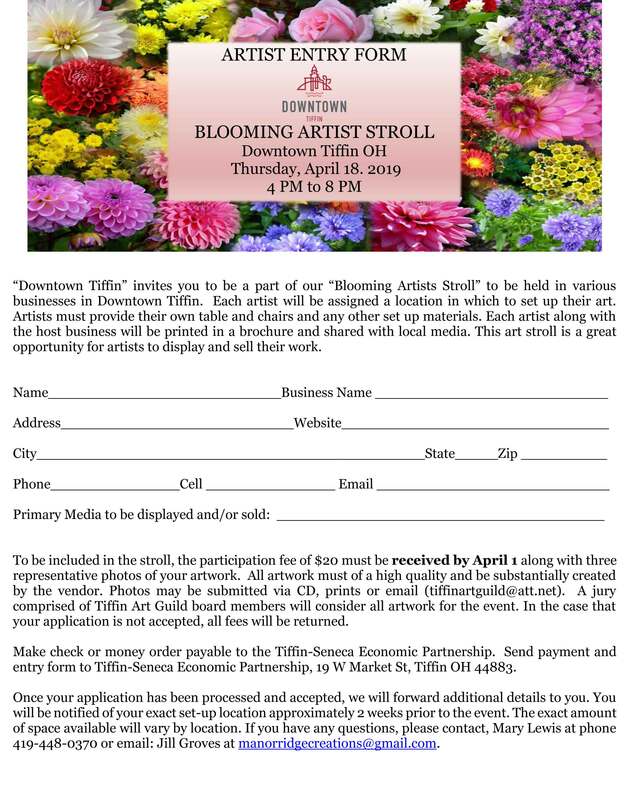 Downtown Tiffin is sponsoring the Blooming Artist Stroll 4-8 p.m. April 18, 2019. The stroll will feature musicians and local artists that will set up their creations inside of downtown Tiffin businesses. Door prize entries will be available at each location. Artists are needed to set up at this event for a small fee. To apply, download the application here. The revitalization of downtown Tiffin began in 2011, when a group of community members came together to for “Tiffin Tomorrow”, with the goal of promoting and encouraging economic development in downtown Tiffin, and creating plans, programs and actions to ensure long-term vitality and prosperity. In 2014, the city of Tiffin contracted with SIEDC to act as the downtown organization and “Tiffin Tomorrow” came under the SIEDC umbrella as the “Downtown Development Committee,” which serves as the governing board of the downtown organization. For more information, click here. TIFFIN, OHIO – March, 2019 – Diners have recently voted the Empire as the favorite in ALL categories in our region for the third year in a row on OpenTable.com! Check out their profile on OpenTable here. Step 1 – Contact Nick Dutro at TSEP, dutro@tiffinseneca.org or by cell at 419.767.0328 Nick can verify the project is in the CRA and help determine if there are any other resources that can help the project. Step 2 – Draft and send a quick “letter of intent.” Once Step 1 has been completed, an email and/or letter should be sent to Seneca County Auditor Julie Adkins at jadkins@seneca-county.com. It needs to identify the parcels involved, amount of investment, business doing the investment, and timing. Step 3 – Complete the project. Seneca County Auditor Julie Adkins at jadkins@seneca-county.com. She will then review the application for eligibility and completeness, and then verify the project has been completed. If the project is eligible and the application is complete, she will issue a letter notifying the applicant that the project (property improvements) will be exempted.